The system of Qigong / Qigong Shi Ba Shi is a nice series consists of 18 training, easy to learn and suitable for both beginners and experienced people in the practice of Qigong / Chikung. By practicing Shi Ba Shi, the practitioner can activate the internal organs and energy meridians, thus achieving your body reaches a state of relaxation both physically, Mental and emotional. As well, these exercises belong to the Traditional Chinese Medicine, its practice can help maintain health and improve disease. All participants of this course, they will hand over a dossier of notes, explanation of exercises practiced. Sin ningún compromiso, you can attend a trial lesson totally free. 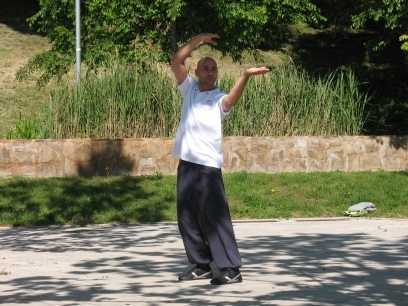 it course will be conducted by Iván Trujillo, instructor Qigong / Chikung. The Monday and Wednesday 19:00 the 20:00 hours, September to June, are taught clases de Taijiquan / Taichi Chuan in the gym located on the 2nd floor of the modernist building House Jacint Bosch, the street Theatre, No. 4, Headquarters Take Minyons Castell de Terrassa. These classes are led by Iván Trujillo, profesor de Taijiquan de Wudang de Internal Alchemy. Sin ningún compromiso, you can attend a trial class for free, to see if what we do is what you want. The Monday and Wednesday 18:00 the 19:00 hours, September to June, are taught clases de Qigong / Chikung in the gym located on the 2nd floor of the modernist building House Jacint Bosch, the street Theatre, No. 4, Headquarters Take Minyons Castell de Terrassa. These classes are led by Iván Trujillo, Qigong teacher Internal Alchemy.